Today's 'In A Vase On Monday' almost took off into the stratosphere whilst still in the construction stage. Although we've fortunately been spared the excesses of storm 'Katie' it was a rather damp and blustery start to the day. A quick trip to check on whether there had been any new germinations in the greenhouse since yesterday was followed by a garden reccie. 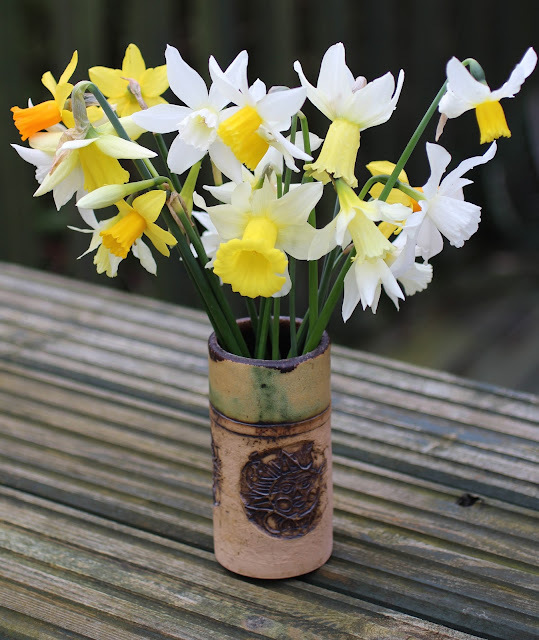 This revealed that some daffodils were looking rather sad and bedraggled so I made the decision to snip. Looking most sorry for herself was the ethereal 'Thalia', which I think is my all time favourite despite her floppy tendencies. Other vase occupants that I can put a name to are 'WP Milner', 'Elka', 'Topolino' and 'Téte-à-Téte'. 'Sailboat' and 'Minnow' refused to join the party as they are only just unfurling. I'm fairly sure that the vase has not appeared before. It usually sits in the study where it's home to my too long neglected paint brushes. It was a birthday present from a friend many moons ago. The sun motif is repeated so you see it whichever way you look at the vase. A companion holds pens and pencils and will no doubt feature as a flower vase in the not too distant future. A special thanks as always to Cathy over at 'Rambling In The Garden' who is the inspiration behind 'In A Vase On Monday'. It finally looks as if it is brightening up out there so I'm off out to potter. I'm looking forward to catching up with spring concoctions in vases both large and small when the sun goes down. Although seed sowing and potting up has now started in earnest we are making the most of the last few long winter evenings indulging in the seasonal pleasure that jigsaws can provide. I would like to say that we always work in harmony but it's not always the case. Right hander versus left hander, different sorting techniques and my preference for having specific areas to complete can sometimes result in minor childish outbursts. However jigsaw evenings usually are most relaxing and companiable. Our latest finished opus was the 'The Gardener's Cupboard'. This is one of a series of puzzles designed by the author and illustrator Colin Thompson. His puzzles are whimsical, full of intricate detail and fiendishly difficult but all great fun. Although each is unique they feature signature cameos which are a pleasure to rediscover. 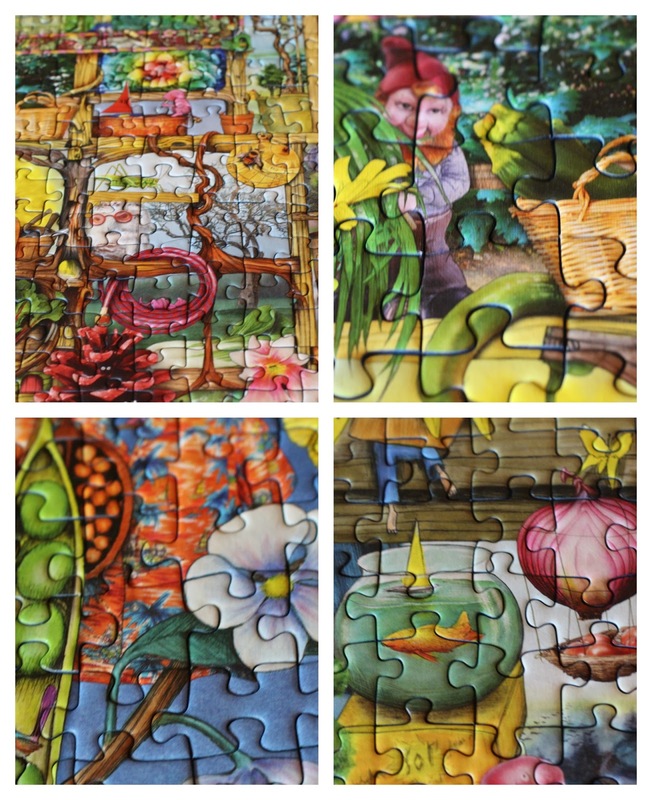 This would be a perfect present for any gardening or even non gardening friend who enjoys the challenge of assembling a jigsaw. My only gripe was that there were no snowdrops in the picture! We are now on to what will probably be the last jigsaw for some time. It's a floral extravaganza to say the least. More information to come at future date when we've finally put all the jigsaw paraphernalia to bed. Are there any more jigsaw lovers out there? It was a case of the vase choosing the flowers this week rather than the other way round when I put together my contribution for in 'A Vase On Monday'. Prompted by the realisation that it's March I set to do some overdue tidying up in the greenhouse prior to serious seed sowing. Amongst other things including a telephone adaptor (one of life's many mysteries) I unearthed a vase that I've been searching for on and off since the autumn. It was purchased at the tail end of the summer when we managed to coincide a trip to the caravan, with with one of the monthly art and craft fairs that are held on the prom at Grange-over-Sands during the season. I should have perhaps taken a before and after photo. The vase is peppered with holes all the way round so the vase would make for an excellent centrepiece. The flowers therein are narcissus 'Tête - à - Tête', my current favourite narcissus 'Elka', some of the last iris reticuluta to flower (label inconsiderately missing from pot) and the odd flower or two of coming to an end of cyclamen coum. Whilst cutting the flowers I was delighted to discover a little clump of cyclamen seedlings which will be transferred at some point. I only realised afterwards that the photo didn't capture the cyclamen flowers which are hiding round the back. With thanks as always to our charming hostess Cathy from 'Rambling In The Garden'. It's cold here but the sun is shining, so it's back to greenhouse tidying again before no doubt visiting some awesome vases later on today. 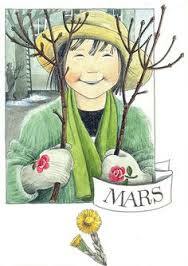 Wears on his smiling face a dream of spring."